Windsor is a historic market town situated on the banks of the River Thames, about an hour’s drive from the Centre of London. Making it an ideal location for a day trip. The town of Windsor is dominated by Windsor Castle, situated in a raised position above the town and well known as one of the official residences of the Queen. This May Windsor Castle will be the setting of the Royal Wedding between Prince Harry and Meghan Markle so will be a hive of activity. 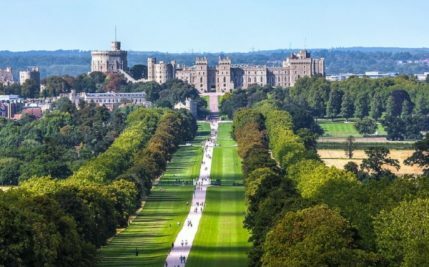 So whether you are considering catching a glimpse of Prince Harry’s wedding or thinking of exploring the immediate area around the town there are plenty of things to see and do on a day trip to Windsor. Occupying nearly 13 acres of land Windsor Castle is the largest and oldest inhabited castle in the world. In 2016/17 1.3 million people from around the world visited the castle. If the Royal flag at Windsor Castle is flying this indicates that The Queen is at home. However, if you see the Union Jack raised she’s not in residence. Located in a prominent position above the River Thames and close to Saxon hunting woods construction of the castle commenced on the orders of William the Conqueror in 1070AD to protect the Western approaches of the City of London. Sixteen years later it was completed and by the late 12th-century Henry II had converted the Castle into a palace. Over the subsequent centuries different Monarchs have added to the structure of the castle till today there is nearly 1000 rooms. So if you are planning to visit the castle and its surrounding grounds it is best to allow at least 3 hours to see everything. The Castle is open from 1st November to 28th February & 1st March till 31st October. This year (2018) the Windsor Castle will be closed on 29th to 30th March, 20th April, 18th to 19th May & 18th June. The park dates back to the 13th Century when it was primarily a deer hunting ground of Windsor Castle. Today Windsor Great Park is a Royal Park spanning nearly 5,000 acres with most parts open to the public to explore by foot, bicycle or by horseback. Notable features include – Ancient oaks, the formal gardens of Valley and Savill Gardens with a varied range of shrubs and flowers from around the world; The Royal Lodge, home to Prince Andrew the Duke of York and Virginia Water a man-made lake dating from the 1740s. Situated just outside Clewer Village by the banks of the River Thames lies Windsor Racecourse. Although horseracing has been known to have taken place in the local area since Tudor times it was not until the latter half of the 1800’s horse racing started at the current site. Windsor racecourse is unique in being only one of two figure-of-eight courses in the United Kingdom. Flat racing takes place between April to October and in the summer months race meetings become a social event in themselves with the addition of musical concerts in the evenings. Situated just outside Windsor on the former Windsor Safari site is LEGOLAND theme park. Consisting of over 55 Lego-themed rides, models, and Lego building workshops. The park is hugely popular with young families. The Park opens from 9 March until 1 November 2018 (closed on selected midweek days in March, April, May, September and October 2018). Windsor is a charming English town, steeped in history surrounded by great countryside to explore making it an ideal location for a day trip out of London.